Humans belong to a select club of species that enjoy crisp color vision in daylight, thanks to a small spot in the center of the retina at the back of the eye. Other club members include monkeys and apes, various fish and reptiles, and many birds, which must home in on their scurrying dinners from afar or peck at tiny seeds. Less clear is what controls the formation of the high-acuity spot, known as the fovea in humans. Harvard Medical School researchers have now provided the first insight into this perplexing question by studying an unusual model: chickens. Connie Cepko, Bullard Professor of Genetics and Neuroscience at HMS, and Susana da Silva, a postdoctoral fellow in the Cepko lab, found that formation of the high-acuity area in chicks requires suppression of retinoic acid, a derivative of vitamin A known to play many important roles in embryonic development. In addition to deepening our understanding of how humans acquired sensitive daytime vision, the findings, reported June 22 in Developmental Cell, could help regenerative medicine researchers model healthy human eyes. If the discoveries hold true in humans, the work might also one day provide clues about how to combat macular degeneration, the leading cause of vision loss among people age 50 and older. The macula is the part of the retina where the fovea is found. "I think it's important to understand how you build this specialized area in the retina that's responsible for any major activity you do during the day, such as reading, driving, recognizing faces and using the phone," said da Silva. "It would also be exciting if people can use what we learn from this basic developmental question to treat diseases affecting the retina." Most of the human retina—the photosensitive part of the eye that translates light into nerve signals and relays them to the brain—is lined with rod cells, which allow us to see well in dim light. The fovea, however, consists almost entirely of cone cells, which respond to color and bright light. 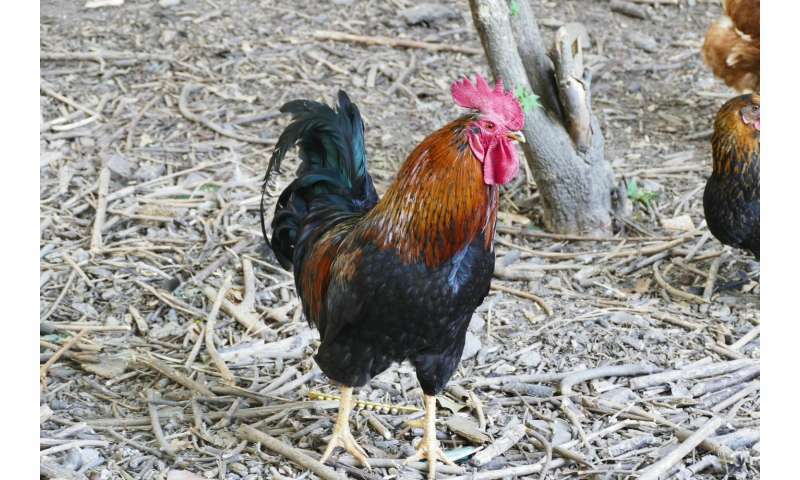 Twenty years ago, a researcher in Cepko's lab discovered that chickens also have a rod-free zone. Although it's not yet clear how closely the chickens' high-acuity areas match ours, Cepko believes it's a good place to start asking questions—especially since scientists' usual collection of mammalian model organisms, including mice, rats, rabbits and guinea pigs, don't have anything like a fovea. In the new studies of chick embryos, Cepko and da Silva found that the complex patterning of cells in the rod-free zone formed because of a drop in retinoic acid that occurred only in that area of the retina and only for a brief time during development. What spurred the drop? Probing further, the researchers found that the answer lay in a shifting balance between enzymes that create and those that destroy retinoic acid. Enzymes known as retinaldehyde dehydrogenases, or Raldhs, ordinarily make retinoic acid in the retina. But Cepko and da Silva discovered that as cones and ganglion cells formed, levels of the enzymes Cyp26a1 and Cyp26c1 surged, breaking down retinoic acid faster than Raldhs could produce it. When retinoic acid levels fell, a protein called fibroblast growth factor 8, or Fgf8, flourished, the investigators found. Fgf8 is another well-known molecule in embryonic development that often works with retinoic acid to stimulate and pattern cell growth. Once their work was done, the Cyp26a1 and Cyp26c1 enzymes ebbed away, allowing Raldhs to replenish retinoic acid in the rod-free zone. Cepko and da Silva saw similar expression patterns for Raldhs and Cyp26a1 in human retinal tissue, suggesting that something similar happens in people. "This is the first mechanism we've uncovered for how this area forms," said Cepko. "We don't know where it will lead, but it's pretty exciting." Stem cell researchers have made remarkable progress in building so-called organoids that mimic human eyes so they can study human health and disease. But they have run into a problem that the new study may help them solve. "People can grow these incredible little eyes from stem cells, but so far no one's been able to form a fovea," said Cepko, who is also an HMS professor of ophthalmology at Massachusetts Eye and Ear. She believes the trouble may arise because the researchers add retinoic acid to their cell cultures. "We're suggesting that removing retinoic acid at the right time, adding Fgf8 or otherwise manipulating these two molecules may allow them to generate a fovea," she said. It's also possible that the research will provide a foundation for investigating why the macula is so prone to disease, which could in turn lead to new treatments. "Macular degeneration is a major problem for the aging population, and we don't understand why that area is vulnerable," said Cepko. But Cepko and da Silva are driven mainly by the excitement of answering questions about the retina, learning about human development and probing evolutionary relationships between species. "Now that we have molecules we can examine, we can ask cool natural history questions," said Cepko, who, with da Silva, plans to study lizards and birds that have two foveae in each eye. "We can also ask questions like, 'Does every species with a high-acuity area use the same mechanisms?'" said Cepko. "If so, we may have inherited it from a common ancestor."